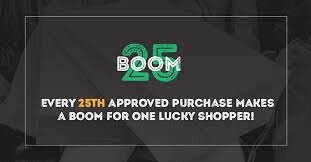 A project I am following with interest as it has the potential to be a great resource for the City. 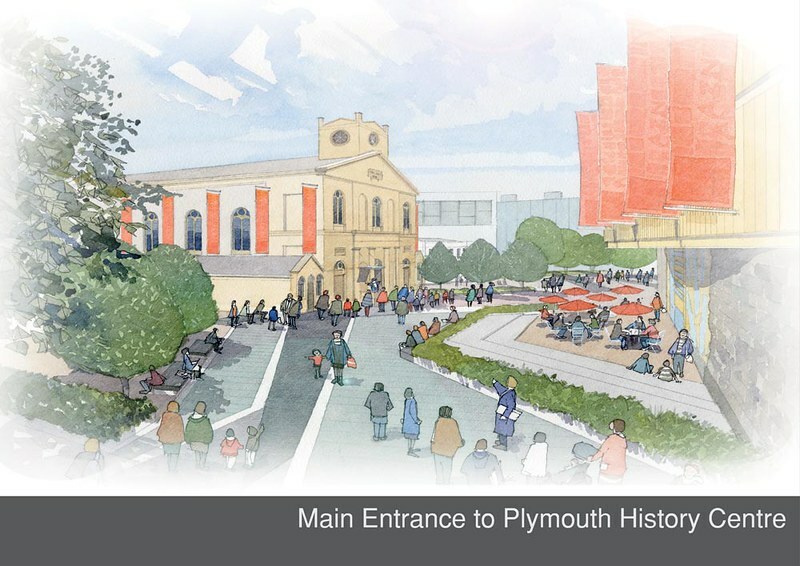 The partners of Plymouth’s History Centre have reached out to the world’s best designers and invited them to submit tenders for the exhibition design for the new History Centre. A couple of weeks ago many of these designers visited the site on North Hill to see the scope of the opportunity for themselves and to experience the partners’ enthusiasm first hand. During their visit, they had an inspirational introduction to the project by Leader of the Council, Tudor Evans who explained what the project really means to the city. They also had a tour of the Central Library building, St Luke’s Church and the existing Plymouth City Museum and Art Gallery, which helped them understand the space and the collections. Staff from the partner organisations, were on hand to talk about the wider historic collections and their aspirations for the project. The tendering companies have also been told that the partners hope the centre will create a “new experience deeply rooted in Plymouth’s cultural fabric” and for it “to inspire visitors to look at Plymouth in new ways”. Programme Director Paul Brookes said “A lot of people have a stake in the History Centre, it is going to be very important to a lot of people, from the local residents of Plymouth, to those who commute into the city, from children and their families, to students, researchers and visitors from afar. We know what we want to achieve, now we need a fantastic, inspirational interpretation and creative company to help us achieve it”. The buildings and architecture that will make up the History Centre present the potential designers with another unique opportunity. They will have the use of the existing historic architecture of the Museum, Art Gallery and Library, and St Luke’s Church. In other spaces the architecture will be formed from a new contemporary extension. The partners are looking forward to seeing how the bidders propose to use these spaces to their full potential, to maximize the users experience and to create an “exceptional immersive and fun environment”. In addition to the collections, the brief points the designers to the city itself: “steeped in history and heritage and vibrant with new culture. The city tells many stories, past present and future”. All of this connects deeply to the collections and it is important to the partners that the chosen designers understand this. The new designers will be chosen by April 2015. 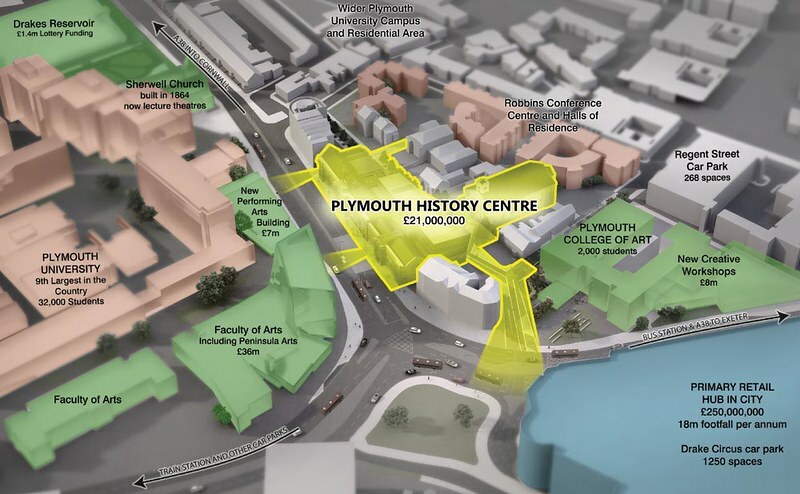 As custodians of collections at Plymouth City Museum and Art Gallery, the Plymouth West Devon Record Office and the Plymouth Local Studies Library, the City Council is leading on the History Centre Project. They recognise the need to preserve, make available and tell the rich and varied history of the people of Plymouth. From the valued historical artefacts, to the pictures, the moving footage and the written word, Plymouth has more heritage than it is currently possible to display. SWFTA is the official Film and TV archive for the South West of England. All of their outstanding collections will be brought under the management of the Plymouth History Centre. The unique collections include the news and programme libraries from Westward Television and TV South West, together with footage which dates back to the late Victorian era. Supported by a large team of volunteers who catalogue, copy, digitize and manage the footage, SWFTA hopes to make more of the footage, more available, to more people. SWiB is currently the custodian of 170 individual collections and close to 1 million negatives dating back to the 1870s. The archive collectively exists as the largest body of photographic records in the region. The Plymouth History Centre will benefit greatly from having access to these collections. The partners within the University of Plymouth include the Faculty of Arts and Humanities, and Peninsula Arts. They are the official partner responsible for providing expertise to ensure the centre attracts and appeals to both students and researchers from around the country. Their vision for the centre is to create a learning hub, as well as a visitor attraction. I will be following future developments over the coming years.